As an admin, you can use the Theme Editor to create custom themes for your institution. Themes are created from existing Canvas templates. Any theme applied to the account also applies to all subaccounts, though the Theme Editor can also be used to create themes for individual subaccounts. Once you have created and saved a theme, you can apply the theme to your account at any time. You can also create new themes based on previous themes. Learn how to manage saved themes. View a video about the Theme Editor. Custom branding is hosted at the account level, and by default, sub-accounts and their associated courses inherit account branding. However, you can enable sub-accounts to use the Theme Editor; any elements that are not specifically changed will still be inherited by the account level. User enrollments are associated at the account level and course enrollments are associated at the sub-account level. An enrollment is created when a user and a course are joined together. If a user is not enrolled in any courses, the Dashboard displays branding for the account. This algorithm also relates to pages not associated with a course including user account and settings, Calendar, and Conversations. User data is always hosted at the account level, which is why they cannot inherit sub-account branding. If a user is enrolled in a course in the account, the Dashboard displays the branding for the account. If a user is enrolled in a course within a sub-account, the Dashboard displays the branding for the sub-account. 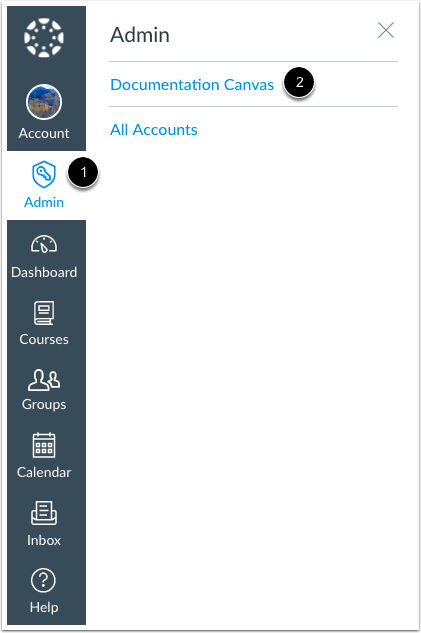 If a user is enrolled in courses within multiple sub-accounts, or if one of the courses is in the account, the Dashboard displays the branding for the account. 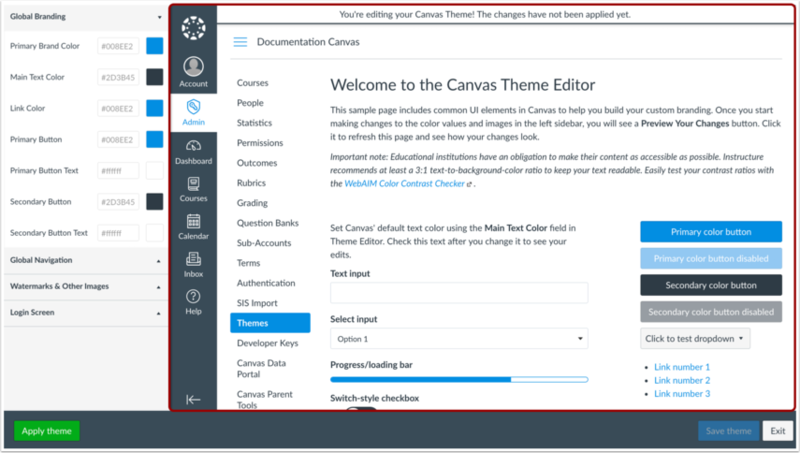 For details about the Theme Editor components, including components that display on Canvas apps, please view the Canvas Theme Editor Components PDF. For help with image templates, view the Canvas Theme Editor Image Templates PDF. 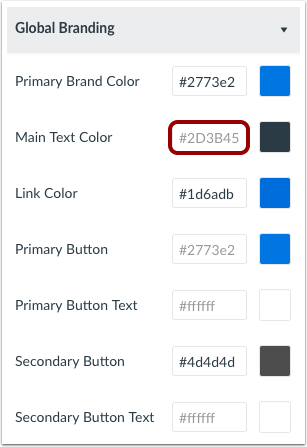 Logos, images, and watermarks are not visible for users who enable the High Contrast Styles feature option in user settings. The Theme Editor is not available for two-week trial or Free-For-Teacher accounts. If you are a subaccount admin and the Themes link is not visible in Account Navigation, Themes has not been enabled for sub-accounts. If the CSS/JS Upload tab is not visible, file uploads have not been enabled for sub-accounts. 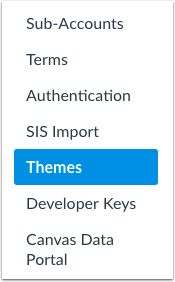 In Account Navigation, click the Themes link. Note: If sub-account themes have been enabled, each sub-account also includes a Themes link. To open the Theme Editor for a sub-account, click the Sub-Accounts link to locate and open the sub-account, then click the sub-account's Themes link. If you do not yet have a Canvas theme for your account, use a template to create a new theme. You can choose from the Default Canvas template, a minimalist template, and a State U. template. 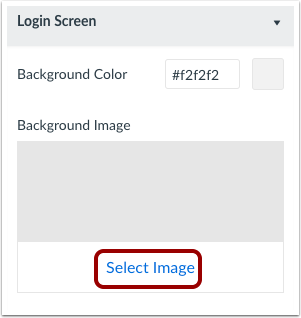 If your Customer Success Manager has enabled the K12-specific feature option, the K12 Theme also appears as a template. To create a new theme, hover over a template and click the Open in Theme Editor button , or click the Add Theme button  and select a template from the list. 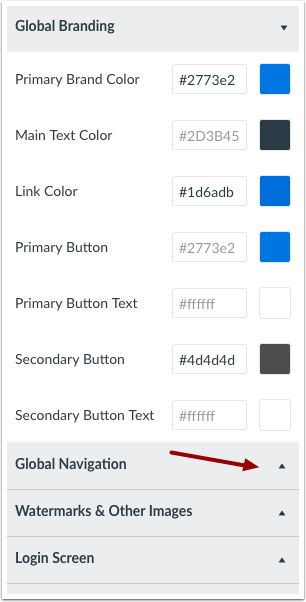 If you previously created and saved a theme, you can edit saved themes at any time. Saved themes display in the My Themes section. To open a saved theme, hover over the name of the theme and click the Open in Theme Editor button . To create a new theme based on a saved theme, click the Add Theme button  and select the name of the saved theme from the list. This option helps you avoid overwriting your previously saved theme. The Theme Editor displays a sample page to preview your custom branding. 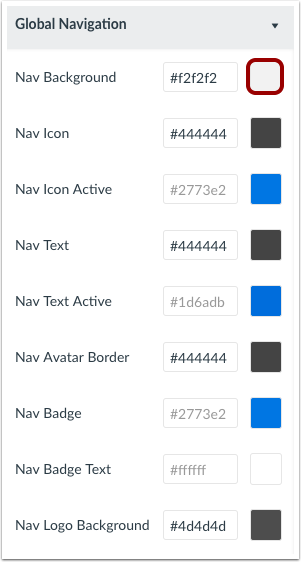 These components will change with the colors and branding that you add using the Theme Editor. The Theme Editor has four component groups: Global Branding, Global Navigation, Watermarks & Other Images, and Login Screen. By default, the Theme Editor sidebar displays the Global Branding group. Locate the component you want to customize. You can expand and collapse groups by clicking the arrow icon next to the group heading. The default value for each component is faded in the text field. To specify a color component, locate the component text field and enter a new CSS color. You can enter colors via hex code, RGB value, or valid color name. Note: Entered colors will convert and display as hex codes. 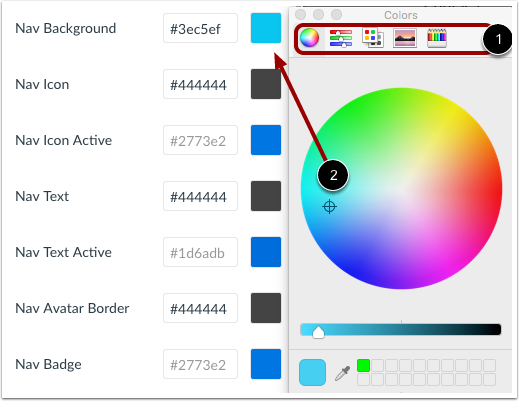 In browsers that support native color inputs, the color selector can be used to choose a value. Locate the component and click the color box. The color selector will appear in a new window. The color selector window defaults to the color wheel, but you can use any of the color tab options to locate a color . Once a color is selected, the component will display the new color in the box . The component's hex color will also update with the new color value. For components that require images, locate the component and click the Select Image link. The image description will include supported file types. To preview your theme, click the Preview Your Changes button. 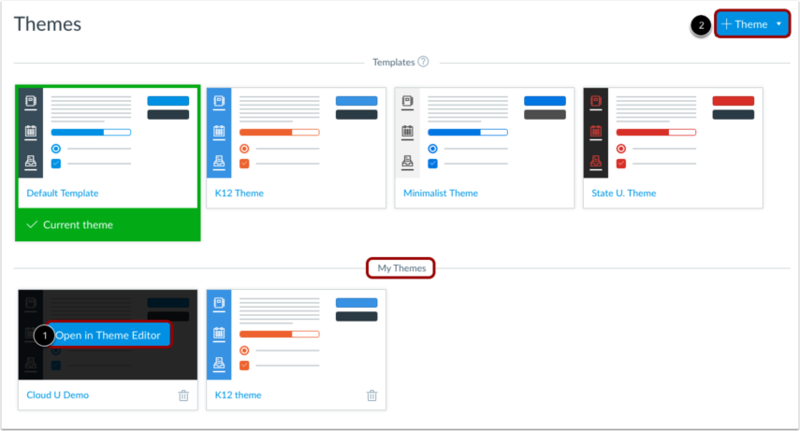 Canvas will generate the preview of the components based on your template changes. If necessary, make additional changes and preview your theme again. Once you are satisfied with your template changes, save your theme by clicking the Save Theme button. If you modified a theme from a template, the Theme Editor creates a copy of the theme. Templates cannot be edited directly. In the Theme Name field , enter a name for your theme. Click the Save Theme button . Note: If you edited a previously saved theme, saving the theme overwrites the previous version of the theme and uses the same theme name. To apply your theme to your account, click the Apply theme button . To exit the theme and return to the Themes page, click the Exit button . You can open the theme and apply it to your account at any time. To apply the theme to your entire account, click the OK button . To return to the Theme Editor, click the Cancel button . Note: If your account allows subaccounts to customize their own themes, any applicable changes you made will also filter down to any associated sub-accounts. Canvas shows the status of your Theme Editor updates; when the process for each subaccount is complete, the subaccount disappears from the progress window. When all subaccounts have been updated, the Theme Editor redirects back to the Themes page. Previous Topic:How do I manage themes for an account? Table of Contents > Accounts and Sub Accounts > How do I create a theme for an account using the Theme Editor?